The lights are aglow along this historic street in Montreal, Quebec in Canada where people flock to during the evening for a fine meal at one of the many restaurants or for a good time in the night clubs. 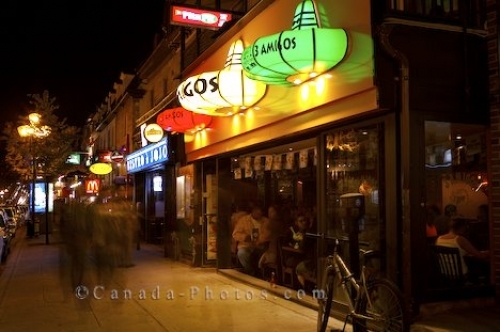 The signs are illuminated in various colors along the Rue Saint-Denis where the architecture of the 19th century Victorian styled buildings are highlighted. Picture of the restaurants and nightlife along the historic street named Rue Saint-Denis in Montreal, Quebec in Canada.